All Replies on You Can't Have it Both Ways! An air leak will reverse the flow of air? Check to see if the impeller has moved on the shaft. I’ve seen this screw up an axial fan type blower…might do it with an impeller. I guess at some point it was working correctly, and this just started? Did I even install it properly? Turn the picture. It all appears to be hooked up correctly. I think the hose leading the blower to the outside is blocked and maybe the impeller has come loose. 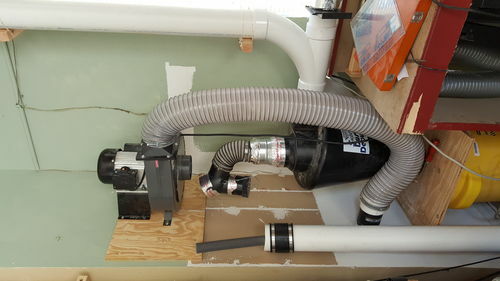 You did, the inlet is in the center of the blower housing, and the outlet is what you have piped to the wall. 1.) You didn’t by any chance rewire the motor did you? Could it be running backwards or running on 120V when it’s supposed to be 240V? (wired as 240V with 120V service?). Air in = air out. That’s physics. 2. )Either you are underestimating suction flow, or over estimating exhaust flow. Remember, if the inlet is 5 or 6 inches in dia, the air velocity will be much less than exiting air through a 4 inch hose. 3. )If they are both the same size, see reason one or two. Ok, I’ll check it when I get home. It’s just really strange. It’s blowing air upwards towards the motor. I didn’t rewire it either. I’ll also check the discharge hose. Does the dust container have to have an airtight seal to the dust deputy? In the picture you’ll see a piece of plywood attached to the deputy. I routered a circular trench in thr plywood to match the lip of the dust container but didn’t silicone it as it has to be periodically emptied. No bungy cords either. I do not know about the motor in HF dust collector, but in order to mount the motor vertically it must have special bearings such as deep-groove ball bearings, angular-contact ball bearings etc. Most probably the dust collector motor has regular radial bearings that must be used horizontally. Dust deputy doesn’t work on its side. Try setting it up like this. Seriously though, it looks right except that the exhaust hose is very long and could be reducing air volume. 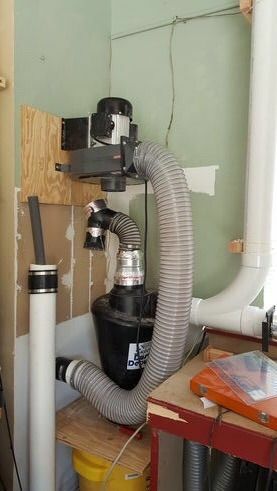 Air out determines how much air can be sucked in so I think you would have better results if you could rotate the fan unit and blow it directly through the wall instead of through five or six feet of curving hose. Bet ya have a plug of debris on the discharge side someplace. A bicycle inner tube around the lip of the trash can will help make a good seal. “at the inlet, the suction part of it is very weak but the blowing part is quite strongat the inlet, the suction part of it is very weak but the blowing part is quite strong” posters, think about this. gmakra nailed it. When I installed the vent, I used a dryer vent. It had a screen on it to keep critters out. And the screen was enough to clog up the flow of air. I removed it and it now works fine. Thanks for all the help. -- If you don't want people to get your goat, don't tell em where it's tied.